I can’t believe I missed October completely. I thought I had written something but apparently not. I am still writing along. I finished a book that I wasn’t happy with. I think that was the struggle to get it done. I’m in the middle of another one, sort of feeling bogged down but that often happens in the middle, where I’m trying to get characters from point A to point B. I like this one better. It’s been rattling around in my brain for a long time and I finally got what I wanted to do with it. This year has been a struggle to keep writing. I don’t know what my issue is. The stories I am starting don’t excite me the way they usually do. I don’t know if it’s the phase I’m in or the stories themselves. But I keep working on them. Although my publishing output will likely be down, I figure I’m learning something about writing through each new book and story. I am starting to gear up for the Anthology Workshop in Las Vegas in February 2019. Soon enough we’ll be starting to write stories for Fiction River. I like the challenge of having only a week to write something on a particular topic and then getting editorial feedback on it. It helps me pinpoint strengths and weaknesses in what I’m writing. Goals for November are to keep up the writing, to make sure I have fun, and to put together a set of short stories, one of which just came out in Fiction River: Pulse Pounders Countdown. I have another version of that story that went long and I want to combine the two into an interesting image of two sides to the same tale, so to speak. I don’t want to say more or I’ll give away the twist. It should be fun. This summer has felt busy. My husband and I are working on having a new home built so we’ll be moving one more time. Hopefully that will be it for a very long while. I hardly have things unpacked for this round. I got as far as I did because I had no idea we were going to move again, at least not so soon. I finally got a book out again. 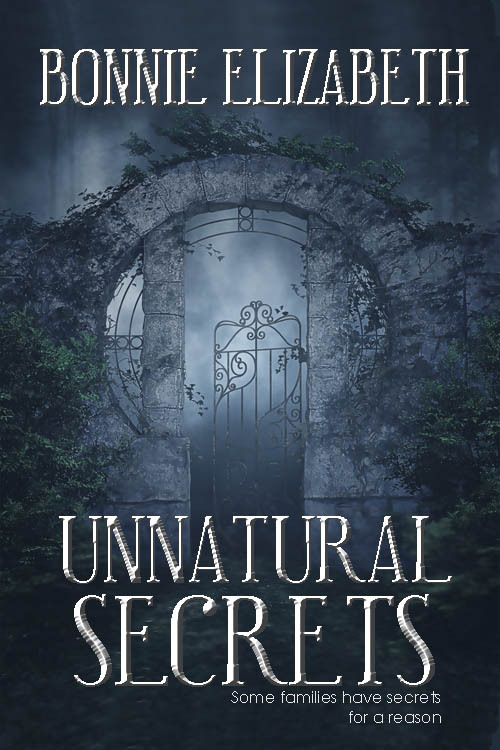 Unnatural Secrets is available at Amazon and Kobo for pre-order and will be available at all other retailers on the seventh. It’s easy to check in to historic Kernroote Castle but checking out could be a different story. Newly divorced Becca Winters hopes to write away her sorrows on an extended stay at the new Kernroote Castle hotel. Unfortunately, the Castle and its companions may have other plans for her. The desk clerk is creepily serious and cold. The hallways are too silent and dark walking down them. Footsteps without a source thunder down the halls at night. Gardens change before Becca’s eyes. Certain she is having a breakdown, Becca intends to tough it out. However, even she has to acknowledge what her senses are telling her. Unfortunately, her acceptance comes too late. Her tires are slashed and she is trapped at Kernroote. Now, in order to save her own life, Becca must unravel the horrifying secrets of the ancient castle and the family that lives there. 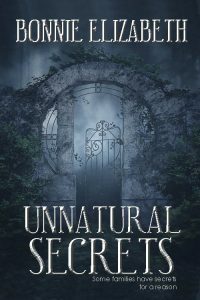 “Elizabeth immerses her reader in the quintessential atmospheric horror, complete with the tension of the panicked fleeing from past nightmares, a foreboding Gothic Castle, and a looming terror that merges modern struggles with a slowly unraveling historic mystery. Make sure you bring a flashlight before you dig in. Oh, and maybe some Holy Water for good measure. Because Elizabeth isn’t afraid to drag you through every conceivable dark and shadowy corner.” — Mark Leslie, author of Tomes of Terror, I, Death and One Hand Screaming and editor of Fiction River: Feel the Fear and Campus Chills. I’d also like to thank Mark Leslie for the input on a better teaser! And I hope that if you like a few thrills and chills, especially now that Halloween is coming, maybe you can go over and give him a bit of reading love. I’m slowly getting back into things. I’m still not back into the free short stories and may scrap that for the rest of the year. I’m just not quite with it enough to make that work out like I had hoped. I got back from a short visit to family and I’m beginning to do some proof-reading on the first two books of the Appalachian Souls Trilogy so that I can finish the third book, hopefully this month. I have been feeling a little bit lost on the short stories. I’m not eager to write them. I am still writing them, simply because I feel between projects but I doubt I’ll continue to push myself on them. Still, I have so far managed over 70 short stories. I’ll easily make 80 before the end of the year and that’s close to my initial goal. If you subscribe to my newsletter, you’ll soon be getting another email and this one offers you the chance to do some beta-reading. Hope you enjoy that. My short story, “How I Became a Fairy Godmother”, which is the origin story of Willow Vaughn, is in the anthology Fiction River: Wishes. It was reviewed in Tangent Online here. The reviewer said, “…loved the setup, but I feel there was far more to explore in the concept.” And he would be right. There are two full books on Willow to explore what else happens when she grants wishes. You can find Fiction River: Wishes, along with One Bad Wish and Sun Spot Magic at your favorite retailers. June sped by. Still moving in and still trying to get myself in a routine that allows me to get to back to doing all the stuff I had been doing before. I am behind on short stories. Barely 60 stories at the end of June. But hey, that’s the minimum I could be and still potentially make my 120 short story goal. The bigger issue for me is that a couple of those stories felt like they could become novels and I want to write those novels. So that makes the shorts harder. I’m still going to power through some more shorts for the next week, maybe two. Then we’ll see where I am as far as wanting to do more or take some time to write longer fiction. I got back a gothic novel from the editor and I hope to have that up by the end of summer, with any luck! It’s off getting some pull quotes from someone more well-known in the genre. Go me! That was a hard ask. At any rate, for those who also read the newsletter, those short stories only for newsletter subscribers (oh you didn’t know? Subscribe here.) will be coming back soon. Hopefully, August. I hope everyone is having a great summer and enjoys their reading. That should have been May. I moved in May and planned to get a blog post written but I had no real internet and so it didn’t happen. No free stories the last two months either but I haven’t taken down April’s yet. But I’m still writing. Even if I’m not communicating. There’s my new books, Souls Lost and Souls Broken out on Amazon. I have one at the editor. I’m working on all those short stories I was planning to write and hopefully have done by September (but alas, I’ll be lucky to finish them by the end of the year I think). How are things going for you? And I hope to get back in a routine soon. All Content on this page is copyrighted by Bonnie Elizabeth Koenig and My Big Fat Orange Cat Publishing. This includes text as well as images. All content is used by permission. Don’t Miss out on Our Special Offers! Get your free book and sign up for our special offers. Don't miss a single one! The cookie settings on this website are set to "allow cookies" to give you the best browsing experience possible. If you continue to use this website without changing your cookie settings or you click "Accept" below then you are consenting to this. This information is given in the interest of transparency and to comply with EU laws regarding the collecting of information. My contact form does collect this information, however I do not use it other than to respond to inquiries and comments via that form. The comment forms on any posts on the blog also collect information. Again, I do not use this other than to respond to inquiries and questions. I do use a third party security plugin that collects information on IP addresses so they can scan for malicious users and bots. To my knowledge they do not use this information in any other way, nor do they sell this information to other users.